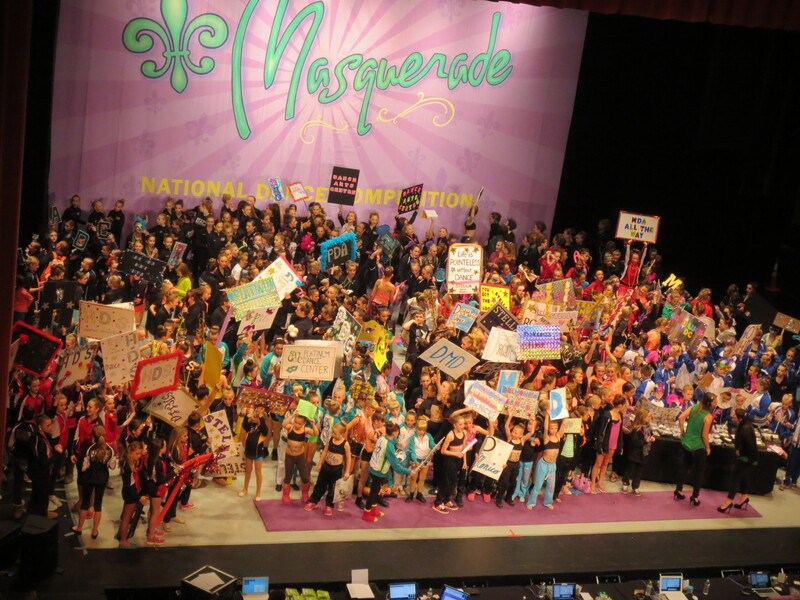 Recently, my daughter’s studio, Lake Area Dance Center (LADC), attended our favorite dance competition of the year, Masquerade. It was held at the Ames Center (formerly Burnsville Performing Arts Center). One of the favorite things about this particular location is the beautiful courtyard (where dozens of young men and women were lined up taking pre-prom pictures). It was a breezy day, but nice enough that the dance brothers all got to play “Minecraft” outside. They decided to continue on a game they made up and played at the previous competition that was held there. It also has a very close proximity to both a Subway and Caribou Coffee. Food and coffee, both must-haves for long days at competitions! One thing I like about this competition, is that even though the food is expensive, it is a relatively inexpensive competition to go to. We don’t have to pay for parking. That ends up saving a huge amount! Programs were only $7! That’s a price I can deal with! There were spots for writing down awards, but all categories and divisions for awards are listed in the back. It was helpful to have those spaces, but I didn’t realize they were there until after the first award session I sat through… It would be nice to have those sections in the program at each award session spot, but it’s better than not at all. They had lots of apparel and other items for sale. Some of it was reasonably priced, some, not so much. Usually they have a deal where you could buy both sweat pants and a “city shirt” at a discounted rate. The city shirts are always great, they have all the studios and dancer names on the back. This year, they did not offer that deal. There was a crew backstage helping the Prop Dads get props on and off stage. This made for even the largest props to get set up and taken down in record time. Way to keep things moving! Dressing rooms were an issue. While they have lots of space in theory, it was packed tighter than a can of sardines. Very cliche, I know, but we were in there TIGHT (especially when virtually our entire studio was there at the same time for production). We were assigned to share a dressing room with another large studio in a room which was about the size of a dance studio. To say it was packed is an understatement! We had an unfortunate event that happened… someone went through my daughter’s things, and $15 went missing. I’m not pointing fingers at anyone!! It’s quite possible that the $15 fell out of her pocket as she was grabbing something out of it. I don’t know. What she told me is that it was in her LADC jacket with the pockets zipped. When we returned to the dressing room, her pockets were unzipped, the money was gone, and there was a large cheese stain on the pocket of her brand new hoodie. She had not eaten anything with nacho cheese, and the spot was about the size of a fingerprint, right in the middle of the pocket. Her ipods, phone, and $5 were still in the hoodie pocket. Other dancers around us did not have anything missing, thank goodness. It just came as a good reminder that with so many people in and out of rooms, be aware of leaving valuables, credit cards, or cash laying unsupervised. We all tend to be very trusting, but things can happen anywhere! The judges were tough. Platinums were hard to come by. Even though it is a bummer not to hear “Platinum” after your child’s every dance routine, it makes you appreciate them even more when they do get them. I feel it is good for character-building. Our hope was that it would make them work that much harder at the next competition! LADC was awarded Best in Show (highest scoring routine overall in the Junior Division) for their production number, Dock of the Bay. It also received the audience choice award. 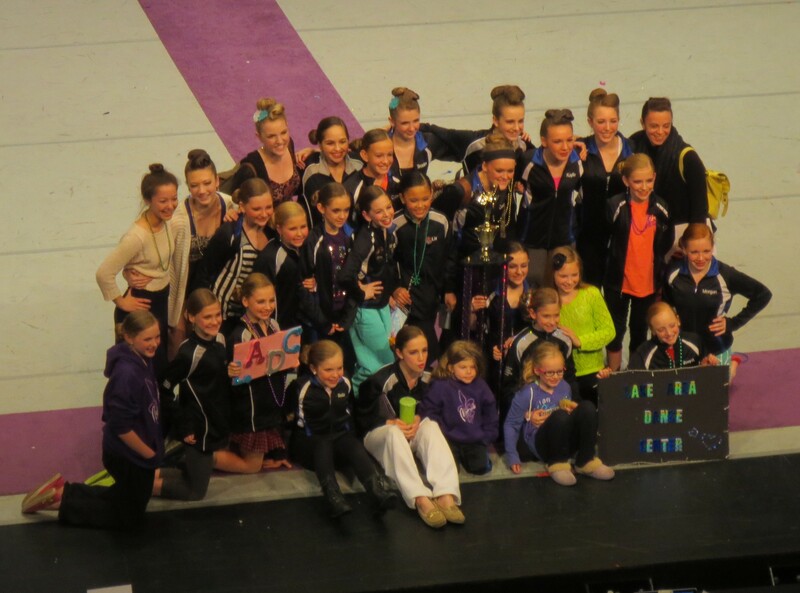 In addition to production, Grace’s jazz dance, The Bachelor received a platinum, and took 1st place overall. It was nominated for video of the week. Her Contemporary dance, Deathly Hallows, got a high gold, and took 4th overall. 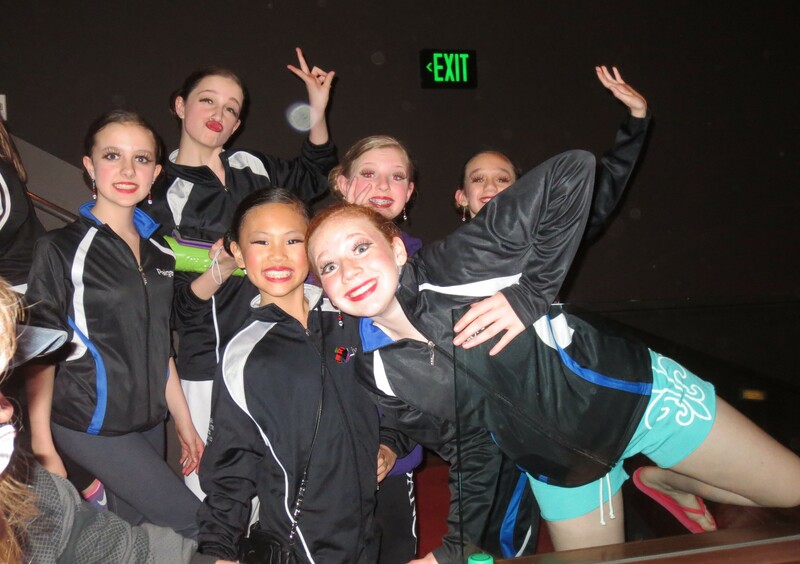 Her tap small group, Girls, got high gold, and 3rd overall in the small group division. Lake Area Dance was also awarded Top Intermediate Studio!! What a great end to a great competition! Previous Hall of Fame Competition – 2014 Next M.I.A.